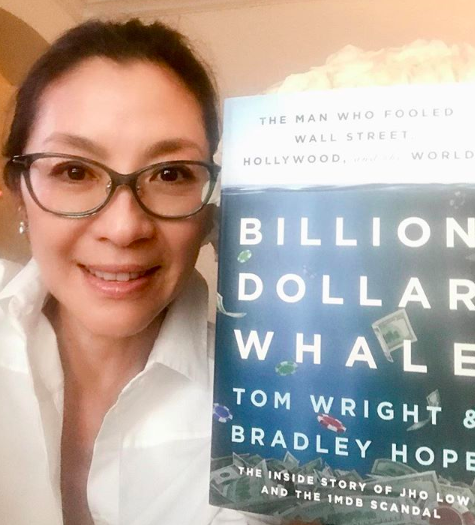 According to The Hollywood Reporter, the actress, who signed a deal with 'Crazy Rich Asians' production company SK Global and its international label Ivanhoe Pictures in August, will be producing the movie based on 'Billion Dollar Whale' – a book on Malaysian fugitive financier Low Taek Jho, also known as Jho Low. SK Global president John Penotti also expressed excitement for the film adaptation of the book. "Tom (Wright) and Bradley (Hope) have crafted a throughly compelling telling of this unbelievable story. While certainly a daring work of investigative journalism, the narrative thread and eclectic characters that they so diligently chronicle make the book read like a thrilling and engrossing novel," John was quoted as saying by The Hollywood Reporter. "We are very proud to be associated with this project and anticipate moving forward very quickly to production," he added. The people who wrote a book alleging Jho Low "fooled a prime minister, the banks and the world' have chosen a BN supporting actress Michelle Yeo to produce it! Suggest people watch the other up-coming film The Sarawak Report for the real story! Prior to the 13th General Election, The Star reported Michelle as defending her decision to openly support former premier Datuk Seri Najib Razak. "We have a leader here who as done so many good things and will do more," Michelle was quoted as saying about Najib by The Star. "I hope from the bottom of my heart that he (Najib) will remain as the Prime Minister and I ask all of you to give him a strong mandate," she added. Photojournalist Amirul Ruslan slammed the irony of having Michelle to produce the 'Billion Dollar Whale' movie. Founder of Centre to Combat Cronyism and Corruption (C4)﻿ Cynthia Gabriel also joined others in criticising Michelle. What do you think about Michelle Yeoh producing the movie? Let us know in the comments below.